GLENDALE, AZ—The New England Patriots overcame a 10-point fourth quarter deficit to defeat the Seattle Seahawks in Super Bowl XLIX last night, but controversy is swirling amid allegations that the Patriots used baseballs in the fourth quarter. While NFL rules clearly require footballs, an unnamed source close to the Patriots organization claims that quarterback Tom Brady prefers baseballs, which are easier to grip and throw. 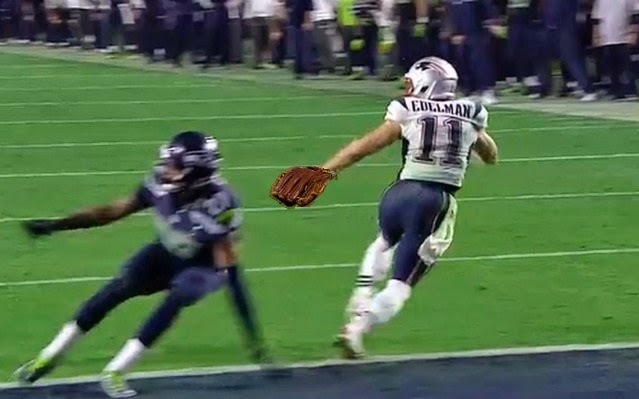 Footage of the game-winning touchdown suggests that not only did Brady throw a baseball, but wide receiver Julian Edelman used a baseball glove to catch it. Brady and Patriots' head coach Bill Belichick both denied any involvement in or knowledge of the switch from footballs to baseballs. NFL Commissioner Roger Goodell said the incident is under investigation.